Recommended to: If I haven't said it enough? Everyone. Really. You want to read this series. Ever since Jack Blank learned that he came from the amazing country of the Imagine Nation, he’s known that his fate could go down two very different paths—he could either be the greatest hero the world has ever known, or its greatest villain. Now the final battle is here, and it’s time for Jack to discover the direction of his destiny. The action-packed trilogy concludes with more surprises, twists, and adventure than ever—along with the same humor and heart that has brought so many fans to Jack’s story. How do I even begin this review? I've got a huge smile on my face as I type this, and am still a bit teary eyed over it all. The End of Infinity wraps up Jack's story in a big way. We find Jack right after the end of the last book. For those of you who haven't started this series yet (shame on you) I won't spoil, but it felt good to have the mystery of what happened to Jack cleared up almost instantly. Or so I thought. What follows is a story that has so many twists and turns that it's hard not to tear the pages as you flip through them like mad. I loved Jack's characters in the last two books, and this one was no exception. Here we find a boy who is broken, lost, and almost at the point of despair. At his core, the same Jack still exists. Intelligent, kind, and courageous to a fault. It's the inner battle that he fights that is taking a toll on him. The End of Infinity shows Jack as he nears the point of no return. Will he become a villain, or a hero? It's all a matter of hope, and the strength that he finds within. Lucky for him, he still has his friends to keep him on the right track. I can't explain to you how great Jack Blank is in this series. I could compare him to other characters out there, but that wouldn't do him justice. What I will say is that he is a role model. Someone to look up to. Despite being constantly told that he wouldn't amount to anything, he did. Even when things seemed horribly bleak, he kept fighting. The resilience and utter strength that this character has is so admirable. This may be a Middle Grade book, but that doesn't matter one bit. Everyone can find something of themselves in Jack Blank and his friends. This is definitely a much darker book than the first two. It was inevitable, as the Rustov war crept closer to Jack and the Imagine Nation. What I appreciated though was that Myklusch doesn't sugar coat the war, but instead shows both the good and the bad in sharp contrast. The fact that hope can spring up even in the face of total devastation. How people who were once at odds can band together to fight for a common cause. It's beautiful and heart wrenching to read some of the scenes in this book. I could go on and on. You've seen me rave over these books. I can't even believe that, at least for the moment, there is no more of Jack Blank's epic story left. Let me tell you, I've been let down by quite a few series in the past. Loved them the whole way through until the last book left a bad taste in my mouth. This series? Jack's series? I absolutely devoured every single last action-packed minute of it. 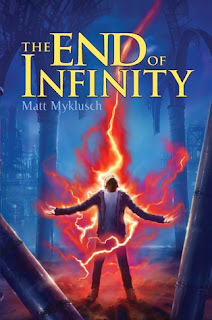 This may be the last book, but Matt Myklusch's characters and the Imagine Nation will live on in my own imagination forever. Welcome to my new favorite book series of all time.